In the early 1970s, I decided after dating a top New York City disc jockey that I had what it took, and that I too could earn a living in broadcasting. I was trained as most girls were in those days to take stenography, get coffee and file papers. As such, I was working a very nice secretarial position in the garment district at the time. My closest contact with broadcasting was calling into my buddy disc jockey Les Marshak to ask him to play a request, which he always did, bless his heart. I chose to pay for and attend a school at night to get my “3rd phone” FCC license needed in those days to be on air. I did some research and found that ATS (Announcer's Training Studios) had classes three nights a week for 3 hours a night, reasonably priced to fit my budget. Not too many other gals made a similar decision, as I was one of only two women in the class. So be it I thought as it was something I had to try. I became very friendly with the other woman in my classes. I was still living at home with my parents and two sisters in Queens, while she had her own apartment in Manhattan. Sue was a beautiful, and very savvy light-skinned black woman and I loved her style. When it came time in class to talk about professional names, Sue was adamant about NOT changing hers. I admired her for that. Being the only females onboard, Sue and I developed a sisterhood that grew into friendship during our time at ATS which would follow us through for a short time in the years to come. Unfortunately, we lost touch many years ago. Sue had grown up in Harlem and her father John was a renowned jazz bassist who worked with the likes of Louie Armstrong, Billy Holiday and Nat King Cole. This lady’s name was and still is Sue Simmons and she has for many years been the very successful news co-anchor of LIVE AT FIVE for WNBC-TV in New York City. 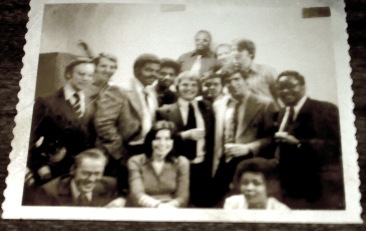 I’ve included an old B&W Polaroid of our ATS graduating class from 1972. It was just us two gals attending in a room full of men. Sue sported an Afro in those days and I know she will want to murder me for sharing the picture. Oh well, look at me I’ve got a mullet! Before her 1980 arrival at WNBC-TV in NY to co-anchor LIVE AT FIVE, Sue took the out of town path, as most truly successful radio and news personalities must do, in order to make it big in a major market such as New York City. She began at WTNH in New Haven, CT, then went to WBAL-TV in Baltimore followed by a stint at WRC in Washington DC. Many have asked me, why didn’t you “go all the way?” Well initially, I was the "successful student" in the ATS brochure. You see, one of my teachers at ATS, Al Arkus was Chief of Production for US headquarters of RADIO FREE EUROPE, at 2 Park Avenue. I did well in Mr. Arkus’ classes and he gave me a job as a reporter for Special Events at RFE. It was radio remember so this was sound only. I covered one of the earliest New York City Earth Day celebrations and was fortunate enough to have interviewed Dr. Margaret Mead there. I was a one woman band, me and my great Nagra reel-to-reel tape recorder, providing and editing reports. Of course I needed the help of another good woman and Roberta who ran the RFE Special Events department was great teacher from whom I learned much. My beat truly was special events. I covered such items as letters to Santa at the Post Office. I interviewed the guy who sprayed the trees in Washington DC for inaugurals. The effort was to avoid dignitaries getting any undignified and unwanted pigeon poop droppings during the festivities. Not to worry, it did not harm the birds. I also did in-studio interviews and learned how to phone feed reports to Munich, the real RFE headquarters. I monitored the news and the space shots of the time, using large reel-to-reel tape recorders and editing out sound bytes. I remember monitoring a little story about a break-in in Washington DC. Day by day I saw Watergate go from some obscure story to page one news. Monitoring the hearings daily was one of the most fascinating things I got to be a part of during my time at Radio Free Europe. On a dare from an old boyfriend, I entered myself in the NY Miss Subways contest. Who would ever have thought I would be chosen as one of the six finalists photographed and then plastered all over the Subway system for voting? I was stunned. However I was also thrilled that under my photo, it actually listed me as a reporter for Radio Free Europe. This was an awesome kudo when you are up there with five truly gorgeous gals most of whom were listed as, "Secretary" for their occupation. I did not win, I think I came in fourth but for me it was one of my lifetime shining moments, not to mention just a great deal of fun. I got my mullet cut and found a great hairstylist in Manhattan right after the photos were taken and posted. So I could actually sit right under the poster on the train to work and nobody would recognize me I wasn’t at all disappointed in that to tell the truth. Then Radio Free Europe was merged with Radio Liberty and the US headquarters was moved to Washington DC. However I was not interested in going with them. I had moved into an apartment on the upper eastside of Manhattan and I was loving life. On Friday nights, I used to hang out in a bar on 82nd Street and Second Avenue called FRIENDS. I knew the owner and the bartenders as well, so if I had any difficulties I had immediate assistance, a wonderful plus for a young woman living in the city. This is where I met Jay Gary Sanderson, the man who would become my husband and the father of my now 23 year old daughter, Merelle. Jay was a former, “bluejacket” (page) and by that time a financial analyst for NBC at 30 Rock in New York. When you fall in love, somehow you just know. My heart and my mind told me there was something about this guy and I had to stay and find out more. So of course, I did not want to leave and chose not to go to Washington DC with Radio Free Europe. I stayed and began a very lengthy & successful career in international television syndication. This of course was not a limelight line of work and it suited me well. Jay and I lived a very nice life on the upper eastside of Manhattan. We lived together for five years, got married at City Hall and were married eleven years. I gave birth to Merelle in 1986. We divorced and Merelle and I moved out to California in 1990. Jay followed in 1992. Unfortunately, we lost him at the age of 45 in 1993 to pancreatic cancer. One day while he was reading the TV Guide, Jay remarked to me about the pretty new co-anchor WNBC hired for LIVE AT FIVE to work with Chuck Scarborough. I looked at the picture and nearly fainted. There she was, Sue Simmons, my pallie from ATS. Sue had made it. I last heard from her while she was at WTNH in New Haven, so it had been awhile. I thought gosh, will she take my call if I try to get in touch? Will I be envious, have second thoughts about what I chose? After all we do not always make the right life decisions and I had a fleeting momentary thought wondering if I should have gone to Washington DC with Radio Free Europe. Well, Sue seemed thrilled to hear from me and we immediately made plans for me to come up and meet her at her offices at 30 Rock. It was like old times, only just everyone knew her now. We would get together on occasion and I will tell you that whenever I met Sue for dinner or a drink, it was always somewhat, “whirl-windy”. She could not walk down the street without people calling out her name, or wanting a photo or an autograph. People would fall all over our table, over her and me for that matter, drooling and trolling for her attention. It was then I lost all doubts about the life decisions I had made just a few years back. I did not wish to be Sue, or anyone of notoriety thank you very much. I had chosen the correct path for myself. My life was the right one for me. I do have to admit it was nice to hang out with Sue at 30 Rock and meet people like Chuck Scarborough, Tom Brokaw and Al Roker, who was doing the local weather at that time. However strolling along the street or out in public with Sue always felt to me like a mob scene. I asked her once how she could stand all the attention and she simply smiled at me and said, “I love it!” I sometimes wonder if all these years later she still does. I have such wonderful memories. They include my life with Jay, having my daughter and the privilege of watching her grow up and turn into a lovely young woman, something not afforded to her father. I traveled all over this country and to Europe, meeting television personnel and personalities in my career. My memories and my choices were not just the right ones, I feel they were the perfect ones for this gal. I look forward to making more of both. Join in and write your own page! It's easy to do. How? Simply click here to return to Memoirs.